By Scott Gilfoid: Nigel Benn believes that Dillian ‘The Body’ Whyte as got WBC heavyweight champion Deontay Wilder’s number and would beat him with body shots if/when they face each other. Whyte, 30, has been given the path to a Wilder fight by the World Boxing Council, who ordered him to fight Luis ‘King Kong’ Ortiz (28-1, 24 KOs). Whyte says he doesn’t mind fighting Ortiz, who he refers to as “an old man” if the WBC will make Wilder fight him next and not anyone else. In other words, Whyte wants preferential treatment by and Wilder. Unfortunately, it doesn’t work that way in boxing. When the sanctioning bodies order a fighter to fight a specific contender to earn a title fight, they can’t cut corners and get the title fight right away. They must wait their turn. Whyte doesn’t want to wait his turn, and that’s his problem. The WBC isn’t going to speed up the time that it takes for Whyte to get a title shot against Wilder just because he said so. 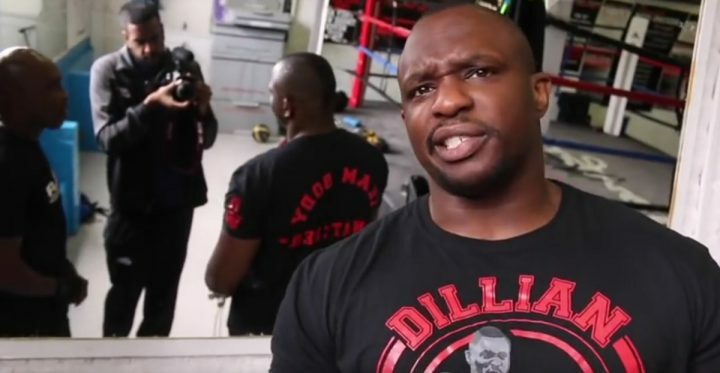 Whyte has to do what they say, fight Ortiz and wait until Wilder gets done with his fight against either Dominic Breazeale or Anthony Joshua. If Benn wants to see how good Whyte is, he should look at video of him of his fights against Robert Helenius, Dereck Chisora and Anthony Joshua. One can get a good sense of the quality of Whyte as a fighter by looking at those fights. Joshua knocked Whyte out in the 6th. Chisora arguably beat Whyte in 2016, and Helenius had him out on his feet in the 2nd round last October. The video of Whyte’s fights against those guys are there to be seen. Had Whyte looked sensational in winning those three fights, then you can bet the WBC would have already ordered the 32-year-old Deontay to defend his title against Whyte (23-1, 17 KOs). “That’s why he doesn’t want to fight me,” Whyte said. “I just defended my No.1 spot [against Lucas Browne]. Now they [WBC] say fight Luis Ortiz. I’ll fight Luis Ortiz, but the WBC and Wilder need to agree if I beat him, he has to fight me next. He’s an old man [Ortiz]. Luis Ortiz has got skills, but I’m young. You can’t roll the clock back,” Whyte said. Whyte’s last opponent 39-year-old Lucas ‘Big Daddy’ Browne was absolutely awful, and that had nothing to do with ‘The Body Snatcher.’ Browne looked old, fat, slow and extremely ring-rusty. The WBC obviously saw the state of condition Browne was in on the night and likely decided on the spot that he was not a suitable opponent for them to make Whyte the mandatory challenger to Wilder. To build these types of fights up, it’s important for the top contender to be matched against a very good fighter to earn the title shot. The WBC obviously feels that Whyte needs to face a better fighter than Browne for him to be given a crack at the American KO artist Wilder. If the WBC makes contenders like Whyte the mandatory for just beating lower level fringe contender like Browne, then there would be a lengthy line of other contenders waiting to fight ‘Big Daddy’ as well. The WBC would be making it too easy for contenders to get title shots if all they needed to do was beat up Browne. I’m just saying. It’s so easy to understand the rationale behind the WBC’s decision to order Whyte to fight the 6’3” Cuban talent Ortiz. It’s up to Whyte to decide whether he wants to take that fight or not, and it appears clear that he just doesn’t fancy the fight. Whyte saying that he’ll only fight Ortiz if the WBC allows him to fight Wilder next is his way of saying, ‘I don’t want the fight. This is my excuse for not taking it.’ I think it pays off for fighters to name drop Wilder’s name to get attention from the boxing fans. If Whyte really wanted the fight against Wilder, he’d take the fight with Ortiz in a second and put himself in position to fight him. Whyte hasn’t done that. All he’s doing is complaining, telling the fans that Ortiz is old, and how the he should already have been made Wilder’s WBC mandatory based on his recent win over 39-year-old Browne. Benn wasn’t much of a body puncher during his own career. He was always a head hunter. I’m wondering why Benn is saying that Whyte should put himself in harm’s way of one of Wilder’s right hands by targeting his midsection? That sounds like foolish advice from Benn. There’s a reason why fighters don’t attempt to throw body shots against knockout artists with 1-punch power like Wilder. It’s because when that fighter lowers his head to throw a body shot, they leave their head completely defenseless to a huge shot. Body punching works against guys with weak to average power, but it doesn’t work against fighters that can knock you out with one shot. If you look at knockout Julian Jackson’s fights, his opponents never targeted his body because it was too risky. When they did, he would knock them out when they lowered their head. Benn telling Whyte to go after Wilder’s body is advice for him to get smashed straightaway. “Deontay Wilder is strong and he can cause you problems, but when he swings, I can clip him to the body,” Whyte said. Whyte’s fights against Browne and journeyman Malcolm Tann have given him a false sense of omnipotence. That’s the downside of fighters facing fodder opposition. It goes to their heads and they start to think they can fight in the same way against good fighters. The best way for Whyte to try and beat Wilder isn’t to target his body. That’s the worst way. I mean, look what happened to Artur Szpilka when he tried to get in close to throw body shots against Wilder. Szpilka was knocked cold with a big right hand in the 9th round. The shot Wilder landed against Szpilka would do a job on Whyte as well. Does Whyte really need to be getting with those kinds of punches by going after Wilder’s body? No. Whyte needs to be smart like Luis Ortiz, and box Wilder and wait for an opening later in the fight rather than going after his body and potentially getting knocked out right off the bat. “He misses shots by a mile and he leaves himself open,” Benn said about Wilder. What Benn isn’t saying is that when Wilder throws wild shots, he does it after he has his opponents out of their feet after hurting them with a right hand. The reason why Deontay’s opponents can’t take advantage of the openings he gives them is because they’re too hurt. Wilder has got them where he wants them when he starts throwing windmill shots. Wilder would probably be better off getting the proper distance to deliver one huge right hand after he has his opponents hurt rather than throwing his windmill shots, but it looks like it’s a force of habit for him to start throwing wild punches when his opponents are out on their feet. “Deontay Wilder, a good high guard, heave movement, a jab and body punches, you can beat him all day long,” Whyte said. “He’s so wild. If you hit him with a good stiff jab, you knock him over. Let’s see what happens. That’s the fight we want. Deontay needs to be a man,” Whyte said. If Whyte wants the Wilder fight, then he needs to tell his promoter Eddie Hearn to forget about facing Kubrat Pulev in an IBF title eliminator and instead take the fight against Ortiz. Of course, if Whyte takes the fight with Ortiz, he’s going to still need to wait for the Dominic Breazeale, the primary WBC mandatory, to get his mandated title shot against Deontay. Whyte might also need to wait for Wilder to get done fighting Anthony Joshua. So, at best, Whyte would only need to wait two fights for him to get his fight against Deontay, if he beats Ortiz to earn the fight. We’re likely talking about Whyte getting a title shot against Wilder by late 2019. It obviously won’t happen in 2018, because Wilder must fight Joshua and Breazeale first. But after those two guys are out of the way, then Whyte can get his shot at Deontay. If Joshua wants a rematch against Deontay, then that could slow things down a bit. I still think Whyte will be able to challenge Wilder by late 2019. I can’t see the WBC making Whyte wait longer than that if he agrees to face Ortiz in the WBC title eliminator and beats him. Whyte will have done his part to earn the fight instead of having it given to him after his last two wins over Browne and Helenius.